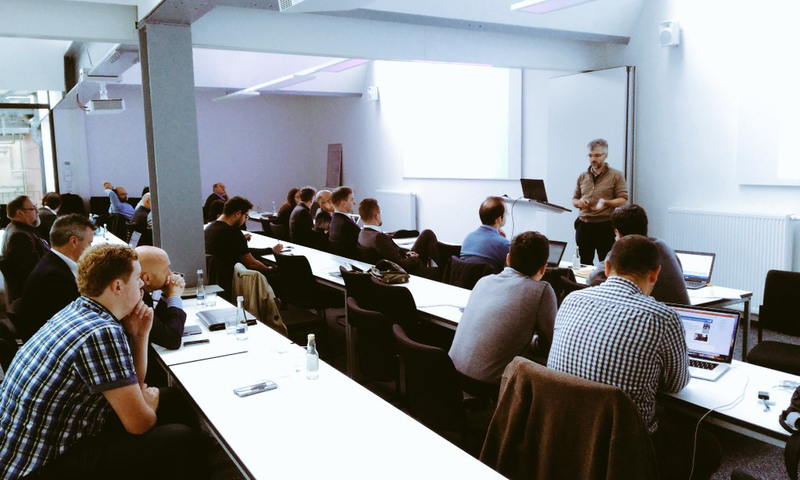 Last week, members of the FourByThree consortium gathered at ZeMA’s (Zentrum für Mechatronik und Automatisierungstechnik) facilities, located in Saarbrücken (Germany) for the last technical and plenary meeting of the project before the final review meeting, which will take place at IK4-TEKNIKER’s headquarter’s on November 30, 2017. The meeting provided an opportunity to check the status of all the work packages, deliverables and results. The exploitation strategy, including the updated version of the project’s webshop, was also analysed. Partners had the chance to see the two pilot scenarios that have been set up at ZeMA: one of them is a collaborative welding scenario corresponding to project partner WOLL; the other, a collaborative riveting scenario corresponding to Premium Aerotec. The riveting scenario was particularly impressive due to the large-scale of the aircraft part, which made it necessary to build a surrounding structure for the operators as well as a lifting platform for the cobot. The two scenarios were recorded by a professional film crew, in order to produce videos that will be shown at the plenary meeting and will further serve for dissemination purposes. The STODT scenario (Hengelo, Netherlands) had been recorded the week before, and the scenario at IK4-TEKNIKER will be recorded at the beginning of the next month.